It is hard to imagine a mobile app that does not involve animations. Whereas on the web, animations are typically pretty simple, if existent at all — a new page can replace the existing one; mobile applications demand a different level of attention. CSS3 has a relatively simple API that can let you make some pretty basic animations. But you don’t have that on React Native. It probably wouldn’t be enough either way. So, if you work with React Native, and need to implement meaningful animations, what do you need to know? 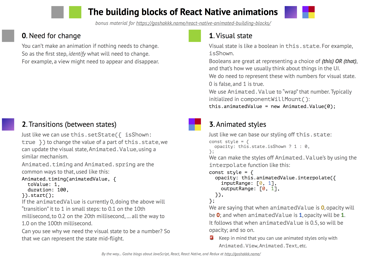 React Native has Animated, but it does look scary… at least at first. So here are three “clusters of things” or “blocks,” if you will, that I think of when working with animations. From being hidden to being shown. From a circle to a square. Think what needs to be shown both before and after an animation. Should a thing appear by changing opacity, or should it “fall down” from the top? Should a circle just morph into a square, or should it become a triangle mid-way? Logically, some component can be either shown or hidden — true or false; it can’t really be somewhere halfway. In your state, the status of whether something is shown will be either true or false. In a good UI, things aren’t hidden right now and suddenly shown the next moment. They “appear” gradually, to help the user make sense of the interface. So it’s clear the visual state can be somewhere between just true and false. We can introduce another variable to represent the visual state of the slider. We want it to be a number because no matter what the logical state is, numbers allow us to represent the states in-between. While the logical state can be binary (i.e. either true or false, 1 or 0), the visual state is floating-point. Say some component is hidden: it means the logical state of its visibility will be false, and visual will be 0.0 too. But what happens as we want to show the component? The logical state should immediately become a true, whereas the visual state should go to 0.1, 0.2, … and all the way to 1.0. For that, we need a way to tell the visual state to go to 1.0. And there is. Actually, a few. Here, we tell Animated to change _shown up to 1.0 in the span of 300ms. There are other transitions and ways to orchestrate multiple transitions, but we can keep it to Animated.timing for now. Our transitions of _shown between 0.0 and 1.0 are all for nothing is we can’t see them. So how can we see them? We should somehow be able to use _shown to set the opacity of the child component. We were setting the opacity to 0 when hidden, and 1 when shown. Can we use this Animated.Value we have, _shown, to animate it between 0 and 1? We can use any animated value to influence the style. Isn’t this a post on ANIMATIONS? How come there hasn’t been a single picture up until now? This may sound like a scary word, but the idea is pretty simple: it allows us to keep the visual state between 0 and 1, but kind of “map” to something else, should we need to. Say instead of just making a child component appear; we wanted also to make it “fall down” from the top a bit. And we would do that by putting the hidden component 40px higher, and animate to its normal position as we make it visible. This will create a new animated value that will be between -40 and 0. In other words, it will be -40 when _shown is 0, it will be -20 when _shown is 0.5, and it will be 0 when _shown is 1.0. Dark secret: you can also output colors and degrees from interpolate. Visual state is numeric, as it needs to be able to represent a transition from one style to another. Animated.Value allows representing numeric visual state. Animated.timing can be used to transition an Animated.Value to another number. Animated.Value can be used for styling if you swap View with Animated.View.